Please note that this event is now fully booked however names will be taken on a wait list for possible cancellations. This session will look at the French influence on wine-making on the Tuscan coast and how Cabernet Sauvignon and Merlot have challenged Sangiovese, king of the Tuscan grapes. Exceptionally, this wine tasting will be held on a Saturday night and our host Mignonne Del Piero welcomes us to her lovely house in the Appia Antica area. We will serve a plate of pasta at the end of the tasting so that you have time to enjoy ‘les fonds de bouteilles’. 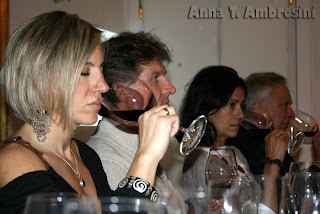 This is the second in a series of wine tasting/lectures planned for the 2010-2011 season. Each session will be given in French and Italian and focus on a specific theme relative to Italian wines. Daniele Maestri, well-known Italian sommelier and a favorite among CCR members for his knowledgeable and lively presentations will lead this lecture and wine tasting. For those interested in ‘wining and dining’, Daniele is also one of the editors of “Due Mila Vini” a guide to Italian wines produced by Italian Sommelier Association.